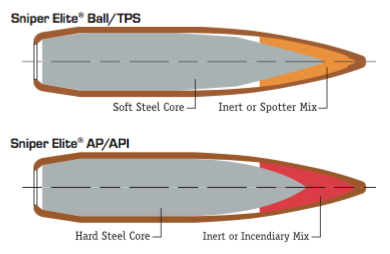 The Sniper Elite® 0.50 caliber (12.7mm) Ball and AP (Armor-Piercing) family of ammunition increased accuracy over traditional Ball and AP cartridges. This family of ammunition is compatible with all common sniper rifles and produces a recoil similar to that of an M33 ball cartridge. The Sniper Elite® Ball and AP cartridges provide low target dispersion at long ranges providing greater accuracy on target. 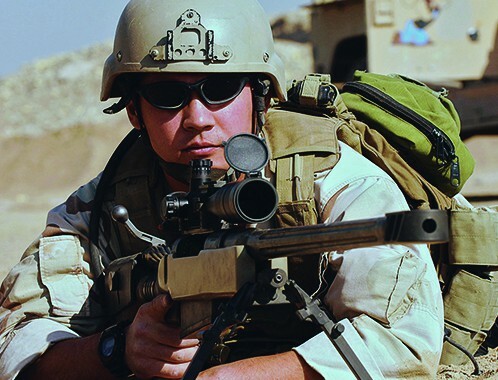 The Sniper Elite® Ball cartridge is available with spotter-flash-on-impact tracer option (known as TPS.) The Sniper Elite® AP cartridge is also available with an optional incendiary function (API.) In all, four projectile configurations are available.